( 4 ) The location and elevation of bolt meets the design and specification requirements. 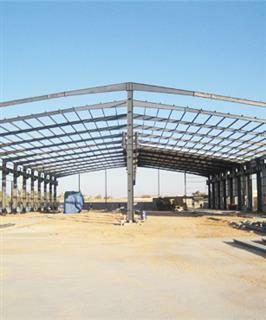 Before lifting the steel structure, the shape and cross-sectional geometry size of the component should be tested based on the relevant provisions of "steel construction and acceptance ", which are not allowed beyond the specification deviation value; the component shall be numbered in accordance with the design drawings and marked installation center. Steel columns should be pop up in both directions to the center sign and the elevation sign; marked lashing point; measuring column length, the length of the error should be recorded and used oil pen to write on the plane next to the center marks under the lower part of the pillar to prepare the foundation top secondary grouting layer surface elevation adjustment. Members enter the construction site, there must be a detailed quality assurance and inspection records; should kind components, models and installation sequence piled in designated areas. Member strata skids should have enough support to prevent the fulcrum surface subsidence; when the same type of components stack, the pivot of each component in the same straight line; for the deformable member, shall be promptly corrected before installation inspection and approval.